China has a “deeply ingrained” need to spar with Japan and other Asian neighbors over territory, because the ruling Communist Party uses the disputes to maintain strong domestic support, Prime Minister Shinzo Abe said in an interview. Abe’s theory on the entrenched motivation behind China’s recent naval aggression helps explain why he has spent more effort trying to counter the Chinese than make peace with them: He thinks the fierce dispute with China over the Japan-held Senkaku Islands in the East China Sea isn’t going away anytime soon. Abe also laid out his plans for deterrence, which include boosting military spending and strengthening ties with Thailand, Vietnam, Indonesia and other nations that share concerns about Beijing. Abe, who is to meet Friday with President Barack Obama in Washington, said the U.S. presence in Asia is “critical” to deter China from taking territory controlled by other countries. His comments came in an interview Saturday with The Washington Post, which The Post was granted on condition that the article not be published until Abe was departing for Washington. In recent years, China has played an increasingly boisterous role in the South China Sea, claiming a massive sphere of territory that includes some of the world’s most trafficked shipping lanes and overlaps with claims of a half-dozen other countries. For Japan, the dispute with China focuses on the remote Senkakus in the East China Sea, islets China calls the Diaoyu. Tensions heated up in September after the central government purchased three of the islets after previously renting them, thereby nationalizing the whole chain. Abe’s assessment of China sounds like a version of the one that experts in Beijing give of Japan, which they say has shifted to the right on foreign policy and security issues in a bid to recover clout and pride lost during two decades of economic stagnation. Abe’s criticism of Chinese education is also notable because, during his first stint as prime minister six years ago, he revised a law to encourage a more patriotic curriculum in Japan’s classrooms. Abe became prime minister for a second time in December, after making a string of far-right campaign pledges to revise the pacifist Constitution and loosen certain restrictions on the armed forces. He also promised to be tougher on China than the previous government of the moderate Democratic Party of Japan. But two months into his term, Abe looks more like a pragmatist than a strident nationalist, focusing mainly on a new, and so far successful, economic policy to weaken the yen and spur inflation. 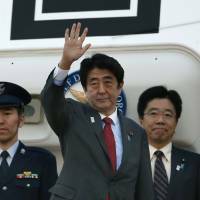 His latest popularity rating is 71 percent, according to the Yomiuri newspaper, a stunning mark in a nation that has cycled through six consecutive one-year leaders. 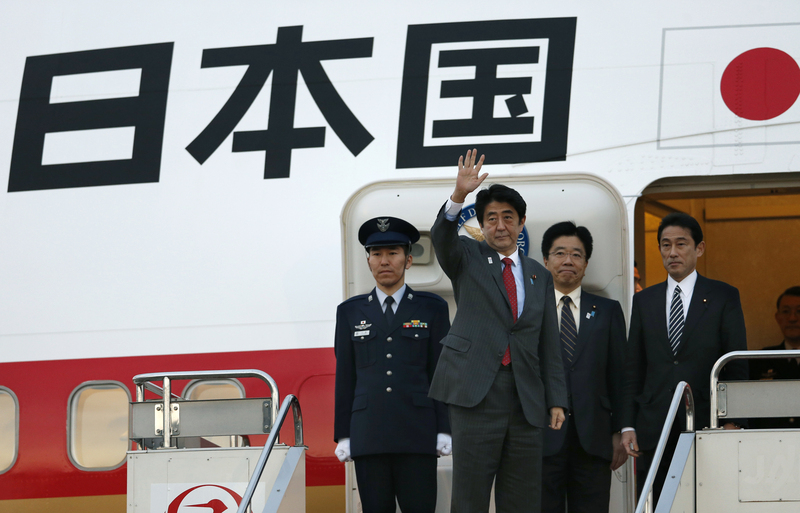 “I have succeeded already in changing the general mood and atmosphere that was prevalent in Japan,” Abe said. The question is whether Abe will change course and begin pushing for his controversial rightwing hobbyhorses after the July Upper House election, which could help his Liberal Democratic Party build an overwhelming majority and leave Abe emboldened. One concern is that Abe may try to water down earlier government apologies for atrocities committed by Japan during the war. Abe, in the interview, said he would someday like to make a “future-oriented” statement aimed at Japan’s neighbors, but he did not elaborate on what its message would be. Beijing has responded to Japan’s nationalization of the Senkakus by sending surveillance ships and aircraft into Japanese territory, drawing Japan into a risky showdown in which the neighbors chase each other around the waters and airspace around the uninhabited rocky outcroppings. Any armed conflict could draw in the U.S., which is treaty-bound to protect Japan. While historical animosities are at the root of Japan’s territorial dispute with China, the maritime conflict is relatively new. During the interview, Abe portrayed China’s actions as part of a 35-year shift that began when the Communist Party opened its once-controlled economy. China’s government has since had to abandon the hope of nationwide economic equality — “one of its pillars of legitimacy,” Abe said — forcing it to create “some different pillars,” including rapid economic growth and patriotism. Abe said China’s tactics at sea are yielding “strong support” domestically. Those tactics, some analysts say, also could prove financially lucrative if China gains control of shipping lanes and access to rich fishing territory, and extracts hydrocarbon reserves. But Abe warned China’s sparring with its neighbors could backfire, potentially undermining trade partnerships and causing skittishness among foreign investors.